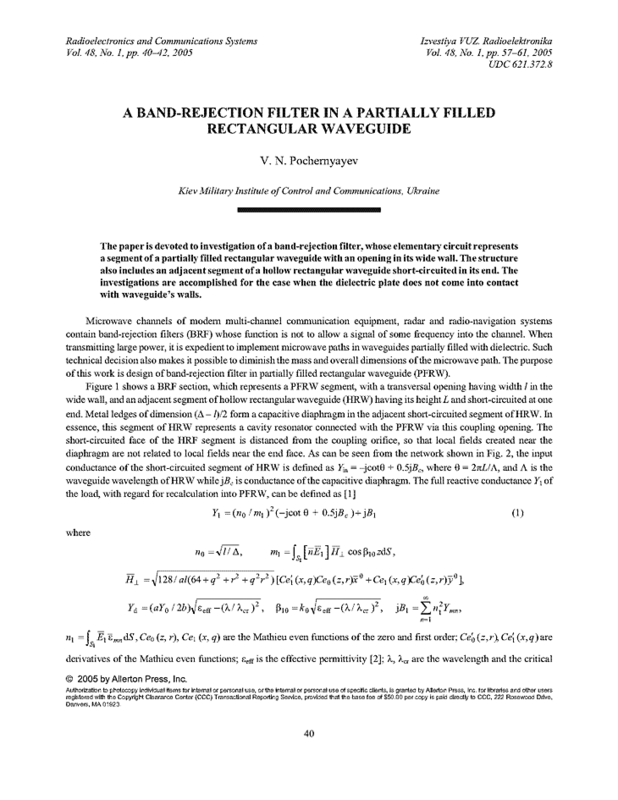 The paper is devoted to investigation of a band-rejection filter, whose elementary circuit represents a segment of a partially filled rectangular waveguide with an opening in its wide wall. The structure also includes an adjacent segment of a hollow rectangular waveguide short-circuited in its end. The investigations are accomplished for the case when the dielectric plate does not come into contact with waveguide’s walls. MASHKOVTSEV, B.M. ; TSYBIZOV, K.N. ; YEMELIN, B.F. The Waveguide Theory [in Russian]. Moscow: Nauka, 1966. POCHERNYAYEV, V.N. ; SKRYPNIK, L.V. Radioelectron. Commun. Syst., v.31, n.5, p.63-64, 1988. POCHERNYAYEV, V.N. ; SKRYPNIK, L.V. Izv. VUZ. Radiofizika, n.12, p.1385-1390, 1990. MCLACHLAN, N.W. Theory and Application of Mathieu Functions. Dover Publ., 1964. GRADSHTEIN, I.S. ; RYZHIK, I.M. Table of Integrals, Sums, Series, and Products [in Russian]. Moscow: Nauka, 1971. POCHERNYAYEV, V.N. Ukrainskii Matematicheskii Zhurnal, n.4, p.566-570, 1995.